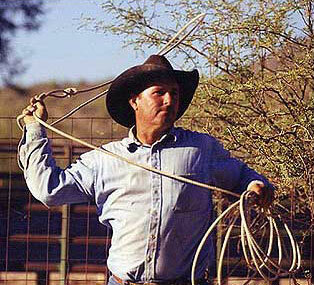 Lloyd Bridwell was the founder and head instructor of the Arizona Cowboy College from 1989 to 2000. He was born in Carlsbad, New Mexico, the son of a son of a cowboy's son. 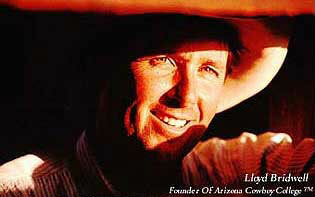 Being a forth generation cowboy made putting together the college a natural and a work of love for him. He died tragically on April 18th, 2000 due to complications from burns delivered to 95% of his body. He is survived by his wife of 17 years, Lori Bridwell, his son Buc and daughters Christa and Alisha. 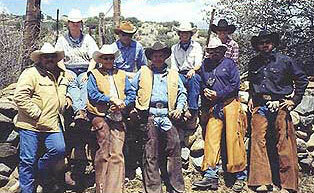 Lloyd's passion was to "Put people on horseback" as he would say and pass on his dying tradition to all who would listen. His knowledge of horses, cattle and the land were unsurpassed. 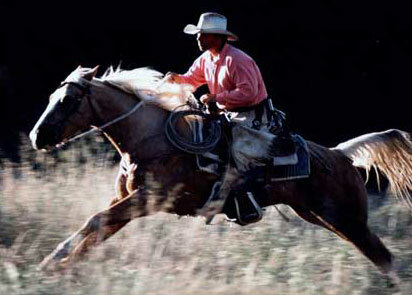 "He was the best there was," long time cowboy Papa Joe Samsill, "The Marlboro Man" once said. "And there is no one who could put this all together like him." His spirit lives on in everything and everyone here at the College and he is truly missed. Lori Bridwell said the best tribute we can give to Lloyd is to make sure his dream not only lives on but grows bigger and better each day. Such a "Free spirit can not die" and his life will be celebrated not mourned, always. Thank you for your knowledge, patience and love.